Left v. right violence - The Norway attacks - Is the counterjihad to blame? The mass murderer Anders Behring Breivik cited many counterjihad writers as he bombed Oslo and slaughtered leftist teenagers in July 2011. He cited many peaceful supporters of the West and many peaceful opponents of jihad and sharia who have never called for violence. Are these counterjihad writers responsible for what he did? Ultimately, all the attempts to blame counterjihad writers for Breivik fail. They fail because none of these writers support Breivik. None of them knew what he was like before the massacre. None of them subscribe to the totalitarian and terrorist ideas in his manifesto, which was only revealed on the day of the attack. None of them applaud his attack. Some even call for his execution. He may link to them, but they do not return the compliment. Here on this page I gather many of the denunciations of Breivik by the counter-jihad. Unless otherwise mentioned, the English-language extracts here are from the Google translation of Breivik's comments on document.no. 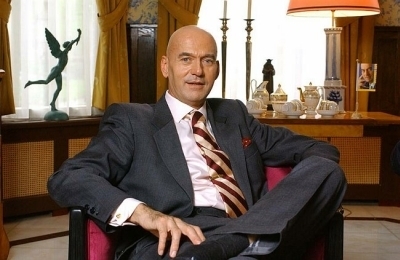 The gay anti-jihadist Pim Fortuyn was murdered by a leftist in 2002. If the counterjihad - by demonising the left - is to blame for Breivik, then the left - by demonising Pim Fortuyn - is to blame for his murder. And will be to blame if Robert Spencer or Pamela Geller now get murdered. Breivik praises all sorts of peaceful anti-jihad sites, that never call for violence, that I have linked to and will continue to link to. He praises Gates of Vienna, Brussels Journal, Jihad Watch and The Religion of Peace. I link to all of these. See original from here. Also here. Jihad Watch of course despises him: "as if killing a lot of children aids the defense against the global jihad and Islamic supremacism, or has anything remotely to do with anything we have ever advocated. ... Some nutcase who allegedly expressed allegiance with the [counter-jihad] freedom fighters kills people, none of whom are preaching Sharia or Islamic supremacism." Gates of Vienna of course despises him: "This foul deed puts the man outside the pale of any human community. I categorically reject the claim that he is "one of us". ... By his acts he is judged, and those killings, ipso facto, make him a City of One, alone in whatever hatred or insanity he dwells." Gates of Vienna links to me on this. He praises SIOE and the EDL, but mainly because he regards them as non-racist. He opposes the BNP because it is racist. SIOE of course despises him (also here): "There is no way that any sane person could possibly conclude that committing mass murder of children would advance the principles for which we stand." More from SIOE: "This disgusting neo-Nazi ... epitomizes the disrespect for life and the contempt for humane values that terrorism embodies, and that we have dedicated our lives to resisting." He links to Pamela Geller. I link to Pamela Geller too. Pamela Geller of course despises him: "there is no compunction in associating me with a mass murderer based on one referring link three years ago. McVeigh watched CNN when he lost it over Waco, so I guess CNN is a terrorist org?" More from Pamela Geller: "This abject loser lowered himself to sub-human status. And he has done this wholly on his own. Nowhere does Christianity or the counter jihad movement call for violence of any kind. ... The pity, of course, is that Norway does not have the death penalty. Because Anders Behring Breivik so richly deserves it." He links to 2006-era LGF (before it went left-wing) and Daniel Pipes. I link to both of these. The above is the original. From here. Also here. Daniel Pipes of course despises him: "Unfortunately, my readership includes some evil people." 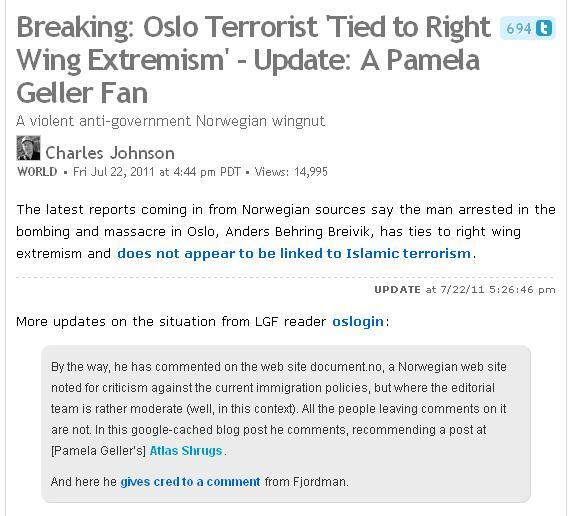 Irony: The now far-left Charles Johnson of LGF crows that Breivik is a Pamela Geller fan. But he does not note that Breivik is an LGF fan too. I told Pamela Geller about the above. When it is pointed out to Charles Johnson that Breivik is an LGF fan too, he protests that it is only one link, and it is innocent. Apart from never treating the link to Pamela Geller like this, Charles Johnson is wrong. It is not just one link. Breivik links to and quotes LGF many times in his manifesto. So Charles Johnson finally sees all the LGF links in the manifesto. And he has to invent some new strange excuse. He says they are indirect links - Breivik quotes a Fjordman piece that quotes LGF - so therefore that doesn't count. 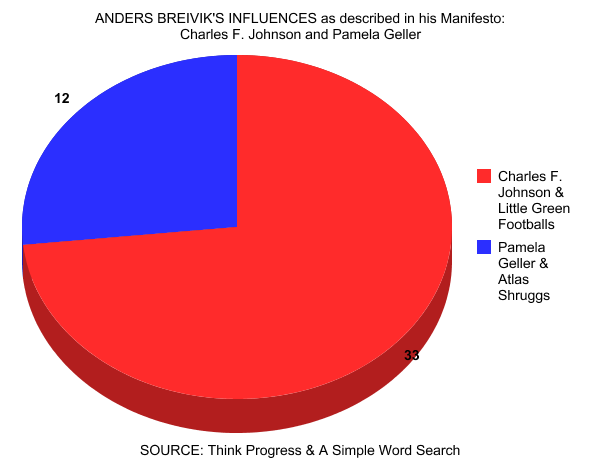 The Diary of Daedalus sums it up for Charles in a simple graphic. I link to Fjordman too. Fjordman of course despises him: "the evil shooter from Ut�ya". More from Fjordman: "I have read about the unspeakable things Anders Behring Breivik did at Ut�ya. Any person doing such a thing is a monster. He murdered dozens of people in cold blood and injured countless others, mentally or physically.". More from Fjordman: "Whoever committed those unspeakable atrocities is a monster and deserves just as little pity as he gave to his innocent, unarmed victims. ... His total lack of respect for human life is not, however, something he can have picked up from me, or from any of the other Islam-critical writers I know such as Robert Spencer or Bat Ye'or." He praises gay anti-jihadist Bruce Bawer. "Anders B" is apparently him. Google translate of this page. See original. Wilders of course despises him: "Wilders said "the attacker is a violent, sick psychopath", adding that the Freedom Party "abhors everything the man stands for""
More from Wilders: "It fills me with disgust that the perpetrator refers to the PVV and me in his manifesto. ... We are democrats at heart. The Freedom Party has never, ever called for violence and will never do. We believe in the power of the ballot box and the wisdom of the voter. Not bombs and guns." More from Wilders: "The assassin ... said that he had committed his atrocity because "It is meaningless to participate in the democratic process." But he is wrong! The mass murderer from Oslo murdered and maimed, and he justified his heinous crime by denying - I quote - "that it is remotely possible to change the system democratically." - end of quote. But he is wrong! The Oslo murderer falsely claims to be one of us. But he is not one of us. We abhor violence. We are democrats. ... The truth is that Islam can be successfully fought with democratic means. We do so in the Netherlands. You can do so, too". The left of course blames the counterjihad for giving rise to the mass killer. But they rather ignore the fact that the counterjihad figures they blame have never called for violence and do not support Breivik. Breivik's Swamp, Toby Archer, Foreign Policy, 25 July 2011, links to me. Archer blames the non-violent counter-jihad for the actions of Breivik. He doesn't care that they denounce him. He uses me as a reference list of denunciations of Breivik by the counter-jihad. Commenter attacks Archer: "Do you have any firsthand experience with this issue at all or was this charming little hit piece a cheap compilation of the blather you might find on Little Green Footballs? ... Shocking as you may find this, there are Muslims in the counter-jihad movement, I know of two personally and many more "moderates" who acknowledge the reality of Islam in the west. By the way, the counter-jihad movement is completely dedicated to preserving the hard-won rights of gays and women, it's that simple and you should study the movement before you speak so out of turn. Read Spencer, Hirsi Ali, Wilders, etc. etc. - all of these leading lights hold gay and womens' rights as central to the movement. Different people and cultures are welcome in the west and most in the counter-jihad reflect that sentiment." A rather sane comment says: "people are impetuously attributing the blame to the bloggers who this Breivik cites as if they intended for him to traverse down the path he ultimately did. Historical precedents inform us that we should be extremely wary to apply this type of knee-jerk rationale (or lack of it). ... Keep that in mind when attempting to defame people and their work of which you patently know nothing (or very little) about." Al Gore's book was a major influence on the Unabomber. Quiz: Did Al Gore say it? Or was it the Unabomber? I only got 4 right out of 12. David Horowitz, 25 July 2011: "The New York Times today has a wretched editorial masquerading as a news story on Robert Spencer and his alleged complicity in the Oslo massacres because his ideas are cited by the lunatic responsible. Joseph McCarthy could not have done it better. The Times next will blame Noam Chomsky for the crimes of Osama bin Laden and Al Gore for the crimes of the Unabomber since the ideas of both were cited by the lunatics. Chomsky is not only cited by the Islamic terrorists, he openly supports them ... Robert Spencer has never supported a terrorist act." Al Gore of course also influenced the Discovery Channel terrorist. Douglas Murray, 28 July 2011: "Some comparisons between Islamist extremists and Breivik are useful. They are certainly similar types of sicko (a fact I hope he comes to realise one day). But there are also salient differences. At least one must be that, in the wake of Breivik's atrocity, not a single Christian leader, right-wing journalist or right-wing politician (including those cited by him) expressed anything other than condemnation and revulsion for his actions. No 'ifs' or 'buts'. No 'important to understand the wider context' or 'driven to despair' nonsense. Just horror. Unlike the suicide bombers who gets shrines and public squares named after them, Breivik (like the Brick Lane/Soho bomber) will only be memorialised among a sick and covert coterie of extremist loners who, though undoubtedly dangerous, speak for no one. The unanimity of the reaction to Norway matters." The left has (of course) been highlighting people that Breivik cites, and blaming them for his actions. Melanie Phillips argues that they are being very selective. The fact is that Breivik cites a vast range of people - almost anyone who ever said anything in defence of the West. To be cited by Breivik does not mean anything. As well as citing Melanie Phillips and Jeremy Clarkson, for example, "Breivik name-checks a vast number of mainstream writers and thinkers, including Bernard Lewis, Roger Scruton, Ibn Warraq, Mark Steyn, Theodore Dalrymple, Daniel Hannan, Diana West, Lars Hedegaard, Frank Field, Nicolas Soames, Keith Windschuttle, Edmund Burke, John Locke, Thomas Jefferson, Friedrich Hayek, Winston Churchill, Mahatma Ghandi, George Orwell and many others; indeed, it's a roll call of western thinking and beyond, past and present." Peder Jensen (Fjordman) notes that even when Breivik cites violent totalitarians, they are not blamed for him, if they do not fit the narrative: "On page 1164 Breivik quotes the Marxist leader Fidel Castro ... Mr. Castro represents a totalitarian ideology, and although he is revolutionary Socialist, he has not been blamed for inspiring Breivik." 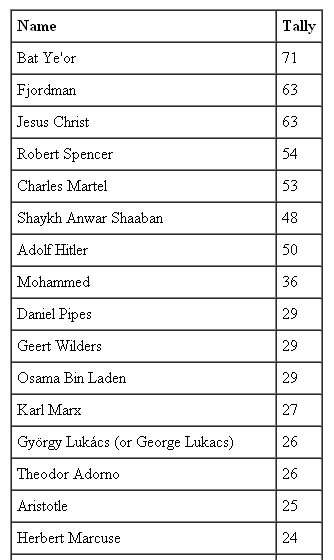 Top people cited by Breivik, by number of cites. I had an offline debate with (then) counter-jihadist Aymenn Jawad al-Tamimi about the more intemperate counter-jihad sites. He said I should not ever link to them. I say linking to one post or essay does not mean I agree with everything they ever say. Aymenn Jawad al-Tamimi on Juan Cole's site (copy at Harry's Place), 31 July 2011, links to me for reference material. I said that he, like others, blames the counterjihad for the Norway attack. He points out that he said: "In the end, responsibility lies with Breivik and his conscious decision to commit these atrocities." He does however think counterjihad sites "ought to re-consider their claims, and how they might be interpreted. Above all, demonization and personal vilification of one's political opponents needs to be abandoned." This is a tall order. "Demonisation" of political opponents is part of normal life in a democracy. Does the left plan to stop demonising the Tories, Fianna Fail and the Tea Party? (Actually, demonising Fianna Fail is ok!) You could also argue that al-Tamimi is "demonising" the counterjihad blogs. He compares counterjihad sites to the "non-violent" Hizb-ut-Tahrir. However, Hizb-ut-Tahrir are totalitarians. They support sharia and a totalitarian solution for the world. They want Israel destroyed. They want to end freedom throughout the world, and replace it with religious rule. Breivik also proposes totalitarianism - he has a lot in common with Hizb-ut-Tahrir. But the counterjihad writers do not. Whether you agree with them or not, they are still normal democrats within the western Enlightenment tradition. They never propose a totalitarian state. Al-Tamimi is linked to Juan Cole and LGF - does that mean he agrees with them? Al-Tamimi means well, and he wants to see a similar future for the Islamic world as I do, but it seems to me that he has been lured into attacking the counterjihad as his primary focus. I said that someone who posts on Juan Cole's site and links to LGF cannot be taken seriously as a real opponent of jihad and sharia. He replies that he takes on Juan Cole here, and he is not an LGF fan - actually Juan Cole added the link to LGF. He also says attacking these counterjihad writers is not his primary focus. He also takes on Juan Cole here. Our offline debate is good (and civil). I broadly agree that Gates of Vienna, Fjordman and Pamela Geller are too extreme for my taste. In addition to which Geller is too unintellectual. I prefer Robert Spencer to the previous, but even he can let me down also. And even Robert Spencer is not really "me" the way Victor Davis Hanson is. I am more of a Victor Davis Hanson man than a Robert Spencer man, let alone a Gates of Vienna man. But I don't like being told who to link to. Al-Tamimi may have a point when he says: "I am pleased that you regard GoV, Fjordman and Geller as too extreme for your tastes; but I feel that at the minimum you should make this clear on your site, and where in particular you diverge, just as you have done vis-�-vis your disagreements with Dawkins." I have indicated divergence on groups like Vlaams Belang here: "I find the LGF view of Vlaams Belang and similar European groups the most convincing. I think the blogs that defend Vlaams Belang have made a mistake. It doesn't mean they are racist - just that they've made a bad call on allies. ... Even though I kind of agree with LGF about Vlaams Belang (!) I gradually stopped reading LGF because of [Charles Johnson's absurd behaviour]." And I don't buy their rosy view of the EDL either. Aymenn Jawad al-Tamimi has since taken a very strange turn. He now disowns all his counter-jihad work. He has been accused of friendship with Sunni jihadists. He replied in an unsatisfactory and confusing message with a lukewarm distancing from the jihadists: "I oppose IS, simple as that. ... I apologize to everyone for my mistake of trying to extract info under my real name from IS sources by feigning sympathy for their views". I don't know who he is now or what he stands for. "The counterjihad is responsible for the Norway attack", says the left. The counterjihad sites did not actually call for terrorism, bombings and shootings. So how can they be responsible for Norway? The claim is that if you criticise people, and someone kills them, then you are responsible. But as Robert Spencer says: "This kind of analysis can be turned every which way. If I am murdered after all this demonization of me, will [his critics] be responsible?" Daily Mail incites violence against Spencer? Spencer replies to a Daily Mail headline linking him with mass murderers: "In my work I have never called for, approved of, endorsed, or advocated violence against anyone, and have denounced attacks on innocent Muslims. If, despite all that, I am responsible for the Norway shootings, then would not the Daily Mail be responsible if someone kills me? ... If I am guilty of incitement, so are they. If I am not, they are not. But they can't have it both ways, and neither can any of the others who are piling on these days. If writing critically about something constitutes incitement to violence, then any critical writing about anything, including writing that is critical of me and my colleagues, constitutes incitement to violence." Melanie Phillips, 1 Aug 2011: "Even if he was motivated by hostility to multiculturalism and Islam, it is perverse to suggest that no one should write about these things because some deranged person raving about such ideas has run amok. It's a bit like saying no one should express concern about late abortions or animal cruelty because it leads straight to the firebombing of abortion clinics or animal-testing laboratories." Norwegian professor Lars Gule says Robert Spencer is partly responsible for Breivik's actions: "Gule thinks that even though you don�t have any legal responsibility ... you still have some moral responsibility because you have inspired [Breivik's] world view. ... Gule claims that by rejecting this moral responsibility, you put yourself outside what is considered decent within a political debate." Spencer replies: "Gule is thuggishly trying to silence (rather than refute) a point of view with which he disagrees by demonizing it. The problem is that he is using an argument that can be used against him, and anyone. I expect that Gule criticizes American and NATO foreign policy. Yet there have been numerous terror attacks committed by people who oppose that foreign policy. Is Gule partly responsible for creating an intellectual climate and line of thought that led such people to commit terror attacks? ... If I am killed in the near future (and I have many death threats), would Gule have blood on his hands?" Spencer then discovers that Lars Gule is a convicted terrorist against Israel! Lars Gule attempted a bombing of Israel in 1977. He was working for the DFLP, the terrorist butchers that carried out the 1974 Ma'alot school massacre. Obviously someone like him should decide the bounds of "what is considered decent within a political debate". Oddly, NPR fails to mention Lars Gule's terrorist past. Harvard professor Stephen Walt is famous for the book The Israel Lobby and U.S. Foreign Policy (2007). Breivik's Warped Worldview, Stephen Walt, July 29, 2011. Walt treads on dangerous ground when he asks: "to what extent can Islamophobes like Pamela Geller or Robert Spencer be held responsible for Breivik's act?" Why dangerous ground? Because, as he says himself, mass murderer Osama bin Laden cited Stephen Walt! "Osama bin Laden also cited some writers favorably, including Noam Chomsky, Michael Scheuer, and yours truly. Bin Laden also mentioned ... Jimmy Carter's "Palestine: Peace Not Apartheid"." Despite this, he plunges ahead with some muddled argument that "Geller, Spencer, and their ilk are not responsible for [Breivik's] specific decisions and actions, of course, but they do bear some responsibility for creating and promoting a vision of cultural conflict that makes such extreme responses more likely." And yet Walt claims he himself bears no responsibility. The argument makes no sense. It gets worse for Walt: New York jihad terror suspect arrested, Nov 2011, and turns out to be a big fan of Stephen Walt's work, which he promotes on his jihad website. 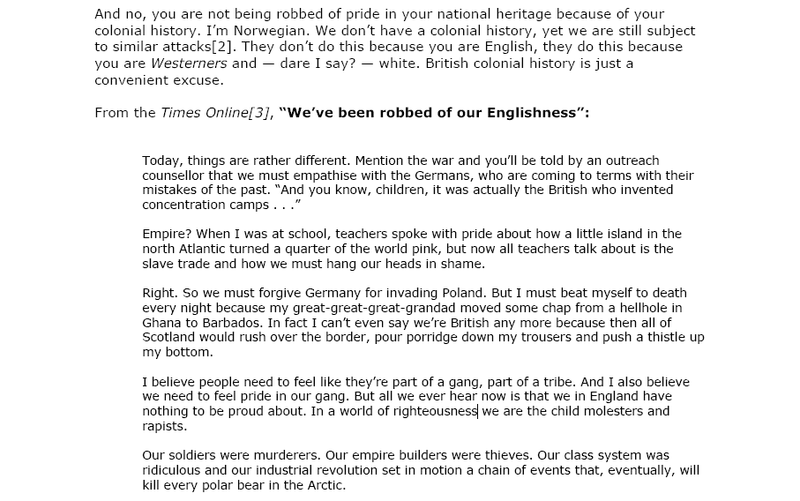 Breivik quotes from Jeremy Clarkson of the BBC motoring show Top Gear. This is from Breivik's 1500 page "manifesto". The very idea that Jeremy Clarkson calls for revolutionary terror is of course ludicrous. But so is the very idea that Robert Spencer calls for revolutionary terror. 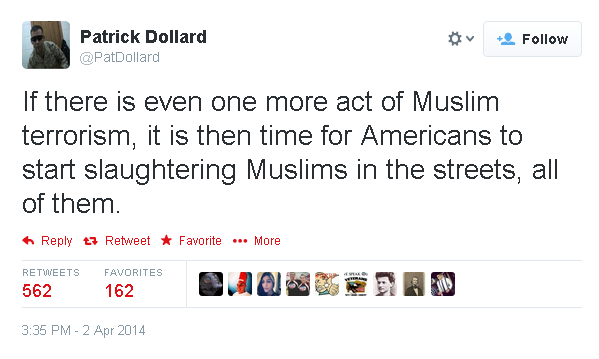 The only counter-jihadist I have seen to actually call for violence is Pat Dollard. What a disgrace he is. Note that his profile has him wearing military gear, but he was never a soldier. Pat Dollard issued this inexcusable tweet on 2 Apr 2014 after the 2014 Fort Hood shooting (which turned out not to be jihad). Despite a storm of protest, he refused to delete it and refused to explain. All counter-jihadists should dissociate themselves from him. I have removed all links to him. Like Breivik, he's an "anti-terrorist" guy who calls for terrorist attacks on Western streets. I think we can do without that type of "anti-terrorist" guy, thank you very much. "It is ridiculous to conduct a witch hunt on Fjordman. He is against violence and for democracy." - Anders Behring Breivik at his trial, Apr 2012, recognises in his madness that there is some clear water between him and the normal counterjihad.